A cider donut from Lakeside Cider Mill in Ballston Lake. If there was such a thing as a <smell class="freshly-baked-cider-donut"> tag, we'd totally have used it for this post. If the <smell> tag ever makes it into the HTML specification I'm never using the internet again. Could you imagine what foul odors the unsavory denizens of the Internet would start flooding into our nostrils? I ate my weight in cider donuts over the weekend and yet I was unsatisfied. They were sugery enough but not cidery enough. Someone needs to dip my computer monitor in that bitter apple spray for puppies in order to detour me from eating the screen. I'm just glad Golden Harvest is closed half of the time I drive by (on my way home, >7pm) or I'd buy cider donuts on my way to and *from* work! Lakeside cider doughnuts are the BEST! I love walking or riding a bicycle to the mill, buying a peck of apples, a quart of cider, and a bag of doughnuts, with one left loose and still warm too nibble on the way home. *sigh* Nothing says "autumn" as gorgeously. 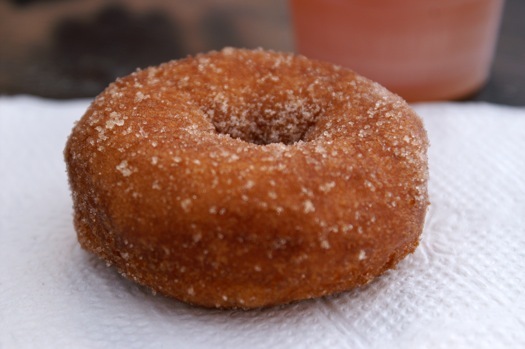 Indian Ladder Farms in Altamont also has amazing, freshly made cider donuts. It get very crowded on weekends but it's worth the trip and the time.